Speed is the key in this highly volatile und uncertain world. A fact recognized by Roland Berger CEO Charles-Edouard Bouée. In his book Light Footprint Management (LFP) presented to the Harvard Business School in September 2013, Bouée defined what a "light footprint" company needs in the global economy. The individual parts of a light footprint company are interdisciplinary, largely autonomous, but are coordinated by a central body. 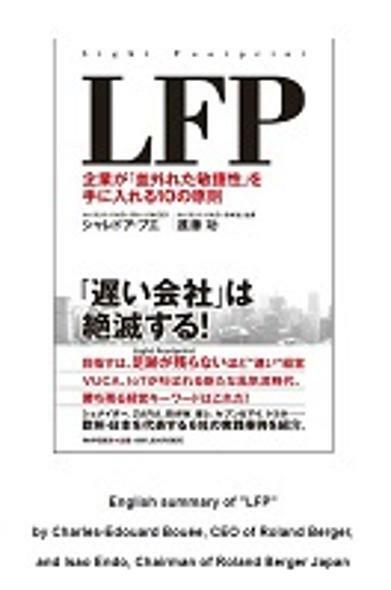 In 2015 and in partnership with Roland Berger Japan Chairman Isao Endo, Bouée has compiled a new book on LFP in Japanese presenting an exclusive insight into six highly successful companies operating in Europe and Japan using LFP methods.Highlighting what the authors call "extreme agility", the new report examines how organizations such as Google and Uber have expanded their businesses at such a rapid rate.Focusing on six case studies including Schneider Electric, ZARA, BMW, Toray, Toyota and Seven & i Holdings Endo and Bouée have been able to identify 10 principles for implementing light footprint management. Four principles are seen as having strategic impact. These include putting extreme agility at the top of the management agenda, buying time, entering into partnerships with organizations which have a very different biological clock from your own and focusing on being first.Three principles address organizational issues. Beginning with divide, delegate and connect, creating a task force team and initiating as early as possible.Three principles cover operational issues, such as starting on site, building intimate relationships and not forgetting how a company started in the first place. Finally the report looks at the impact of Gemba (meaning literally the place where value is created) and Gemba Power on light footprint management.Speed is the essence. We hope you enjoy the accompanying summary of this new work on light footprint management.